In late 2013, Scripps Institution of Oceanography collected multibeam bathymetry and acoustic-backscatter data of the Inner Continental Borderland Region, Southern California. The U.S. Geological Survey Pacific Coastal and Marine Science Center processed these data, and this report provides the data in a number of different formats in addition to a set of map sheets. The data catalog provides the new bathymetry and acoustic-backscatter data, collected mainly in the Gulf of Santa Catalina and San Diego Trough, as well as this new bathymetry data merged with other publically available bathymetry data from the region. Sheet 1 displays a colored shaded-relief bathymetry map of the Inner Continental Borderland generated from the merged bathymetry data. Sheet 2 displays the new acoustic-backscatter data along with other available backscatter data in the region. Sheet 3 displays selected perspective views of the bathymetry data highlighting submarine canyon and channel systems, knolls, and tectonic features. 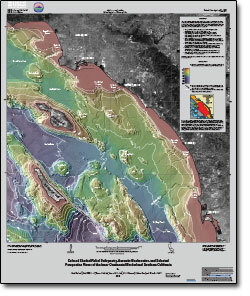 Dartnell, P., Driscoll, N.W., Brothers, D., Conrad, J.E., Kluesner, J., Kent, G., and Andrews, B., 2015, Colored shaded-relief bathymetry, acoustic backscatter, and selected perspective views of the inner continental borderland, Southern California, U.S. Geological Survey Scientific Investigations Map 3324, 3 sheets, https://dx.doi.org/10.3133/sim3324.